Angels' Attic is a beautiful honeymoon cottage suitable for a weekend lovers' retreat or a week's vacation. If you are looking for a unique place for a wedding, the renewal of your vows or a romantic time away, this is it! 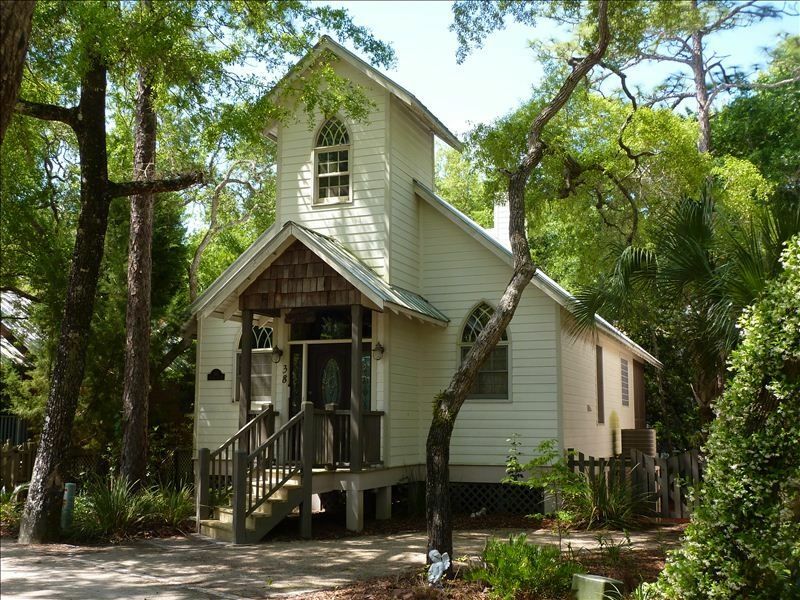 The Landing has a beautiful chapel and conference center available, and Angels' Attic is the perfect cottage for the bride or the loving couple, including a church bell in the tower of the cottage. Being the largest honeymoon cottage in Steinhatchee Landing (an additional 200 sq. ft.), Angels' Attic is the only one providing a separate bedroom and living area. The arched entry with a high vaulted and beamed ceiling welcomes you into a spacious living room with TV, DVD and surround sound, and full kitchen including a dinette and breakfast bar. The double French doors in the living room open to the bedroom, showcasing the unique Claudio-Reyes hand-forged iron bed and nightstands from Argentina. Dressed with elegant linens and a cozy quilt or comforter, the one of a kind bed adds another touch of romance to the cottage. The 2 sided gas fireplace in the bedroom is shared with the bathroom's state of the art Ultra Therma tub for 2, allowing for a relaxing bubble bath at the end of the day. Luxurious bath robes are provided for your use, as well as Key West Aloe bath products, specialty soaps, hair dryer and make-up mirror. For a perfect evening, dim the lights, sip your favorite beverage and let the bubbles relax you. The internet can be spotty sometimes in Steinhatchee. We offer internet, but do not guarantee it. If you must have internet, we suggest you bring a hotspot. It may take several days to have the internet repaired. The second set of French doors open from the bedroom to the large screened porch overlooking Kings Creek. Cuddle up on the swing or sit in the comfy chairs around the table and enjoy the lush natural landscape, the sounds of birds and owls, and the squirrels playing in the trees. Let Steinhatchee do what it does best.....allowing you to enjoy what Mother Nature has provided. The resort provides many amenities: a new pool, Jacuzzi, work-out area, tennis court and basketball court as well as a small petting zoo with goats, chickens and ducks. There is a boat dock with approximately 22 boat slips available on a first-come, first-served basis, with plenty of parking in the resort for your boat trailer. Come to scallop, fish, canoe, kayak, renew your love, or just kick back and unwind. For whatever reason, come, relax, put your feet up and enjoy your time away. Come to 'Old Florida' --- have a time to remember --- you'll love it! The resort is located on the Steinhatchee River. Boat docks are on site. Parking for the cottage is available by the front door. The internet can be spotty in Steinhatchee. We offer internet, but do not guarantee it. If you must have internet, we suggest you bring a hot spot. The kitchen is completely furnished to cook complete meals. Dishes, pots and pans, silverware, blender, mixer, etc. furnished. A full size refrigerator and stove with oven are available. Large screened porch on the back of the cottage. Enjoy the swing overlooking the creek! Tennis Court across the street from the cottage. Bring your racquets. A sauna is available in the pool area. A beautiful 55' community swimming pool is available. If you are interested in having a special event at Steinhatchee Landing, such as a wedding or renewal of vows, please call for additional information. Very romantic place for a quiet get away. Very pleased. The cottage was very nice. Very clean and well kept. The owners were very prompt in answering questions during the booking process. Would definitely stay again for weekend get away. Very comfortable and relaxing. Fireplace and tub/shower were amazing. Kitchen has everything you need to stay in and enjoy being together. The resort has a great petting zoo, shuffleboard, table tennis, and we enjoyed walking around and seeing all the sites. We just got back from a terrific weekend in Steinhatchee. Angel's Attic was a great place to stay. The cottage is clean, cozy, comfortable, and nicely-appointed. We loved the large bathroom with HUGE tub. The community is charming and very close to everything. Thank you and we are already talking about our next visit. A beautiful spot in Steinhatchee, the cottage is immaculate! Our daughter loved the petting zoo, pool, and playground. Steinhatchee is known for Fishing and scalloping. Scallop season is July 1st - September 25th. (Each year start date may vary. Check with us for exact date). Bring your boat or charter one at the local marinas. Information on charters provided upon request. Rates are subject to change until reservation is confirmed. 3-4 Night minimum for holidays Dogs only, must have manager's approval. Unapproved dogs are subject to a $200 fee.